MORDEN - Armenia - Georgia - Comania. . .
MORDEN, R. - Armenia - Georgia - Comania. 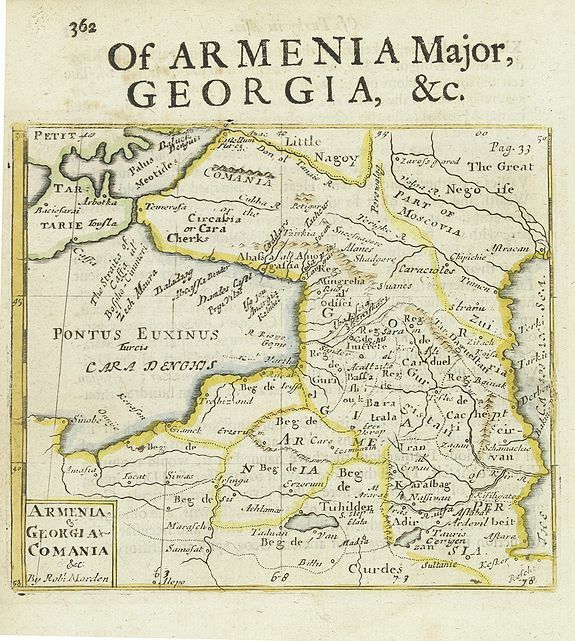 . .
Armenia - Georgia - Comania. . . - MORDEN, R.
Title : Armenia - Georgia - Comania. . ..
Map maker : MORDEN, R.. Size : 4.5 x 5.2 inches. / 11.4 x 13.3 cm. Colouring : In o/l colours. Description :Miniature map showing the east coast of the Black Sea up to the Caspian Sea, published by Robert Morden. Copper engraved map with letterpress text giving a description of Georgia. Condition : Good condition. Paper slightly age-toned.